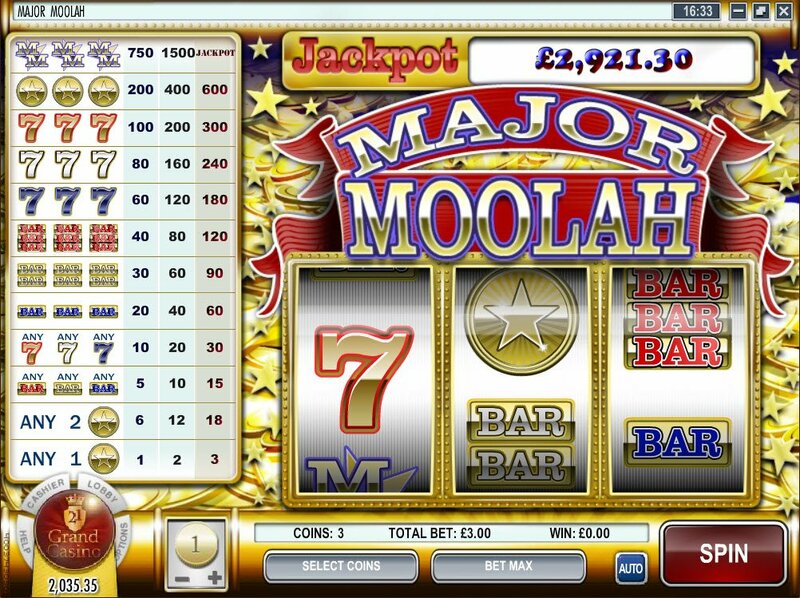 This 3-Reel, 1-Payline Major Moolah slot from Rival Gaming can wow you with the prospect of winning its progressive jackpot. Depending on what time of day it is, and how recently it was won, you might be in for a huge treat. Coin values of other winni9ng paylines are not so high and, unless you are betting maximum on every spin of the reels, you won’t be in with a chance of the jackpot. Is there a Major Moolah in the house? Can anyone lead me to a Major Moolah? 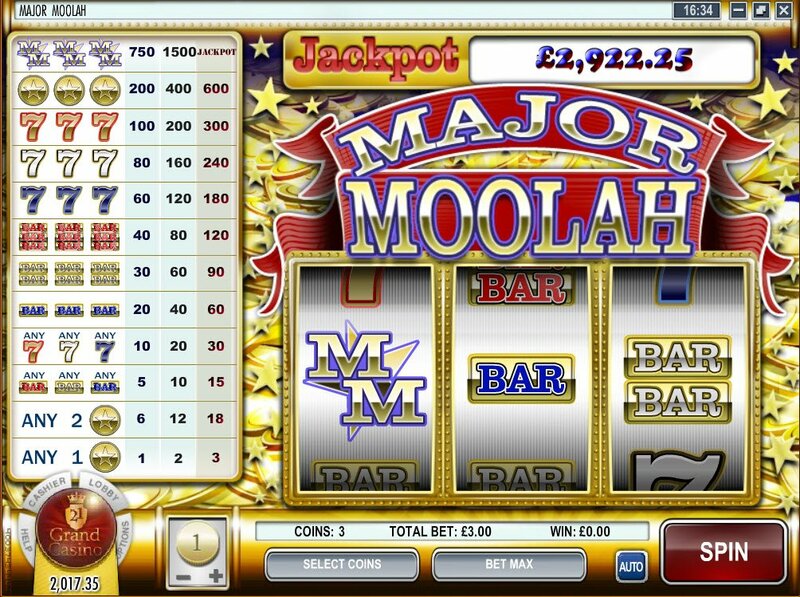 No, it's not a missing army officer we are looking for here, its Rival Gaming's progressive jackpot Major Moolah. This looks like the closest thing to being in a Las Vegas casino, surrounded by the hustle bustle and the slow tempo music and chattering. Complete with all the distinct old school slot machine symbols, the one arm bandit ones included. One or two gold coins will give you a couple coins for your bucket of quarters and, any coloured bar will give you 5 or 10 coins to keep you going. Any coloured 7 will raise the ante to 10 to 30 coins and, then we get onto the same coloured suites. Having a suite is much more poignant in the card games available at an online or land based casino but, there are some coins to be won with them here too. This looks like the closest thing to being in a Las Vegas casino, surrounded by the hustle bustle and the slow tempo music and chattering. Three blue 1 stack bars will get you between 10 and 30 coins, depending on what you're betting with, while three yellow/gold two stack bars will get you between 30 and 90 coins. Three red three stack bars will get you between 40 and 120 coins and, once we enter into the sevens, the rewards start getting slightly more major. Three blue sevens outlined in gold will score you 60 to 180 coins, three white sevens will get you between 80 and 240 coins and, three red sevens filled with gold will get you between 100 and 300 coins. 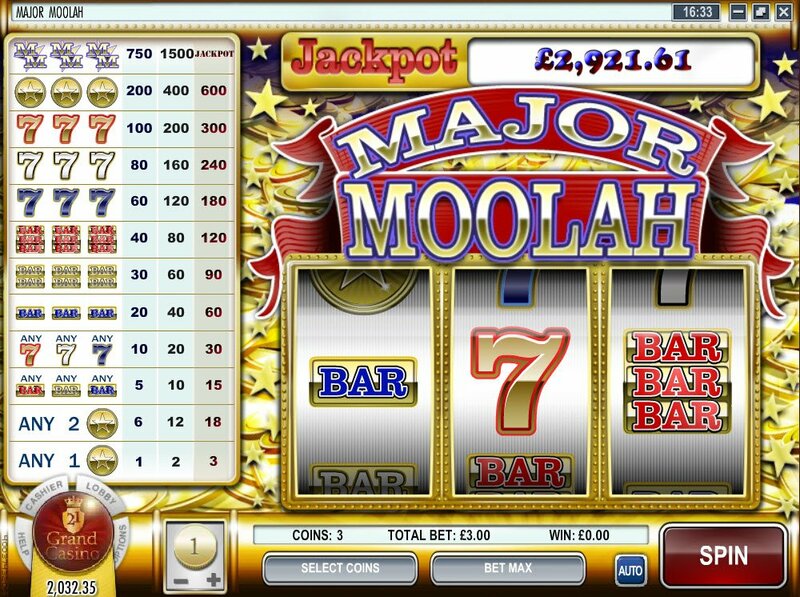 Three gold coins with a star insignia will get you 200 to 400 coins and, that’s when we’re onto our Mega Moolah slot symbol itself. Three of these bad boys, at a 1 coin bet, will get you 750, at a two coin bet will get you 1500 and, at maximum bet, will get you the Mega Moolah slot progressive jackpot, wherever it may stand!